Medicare is a type of insurance that is offered by the federal government and is primarily for individuals who are over 65. Medicare covers things like visit to the hospital and doctor, but it can also cover home medical equipment. Durable Medical Equipment refers to many different types of home medical equipment. 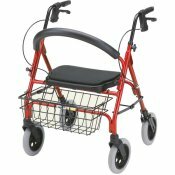 This includes things like adjustable beds, wheelchairs, and mobility scooters. Much of this equipment is covered by Medicare. Originally Medicare benefits were divided into two parts. Part A benefits covers hospital and nursing home stays. Part B benefits includes doctor visits, some types of outpatient hospital procedures, and durable medical equipment. Starting in 1997, those eligible for Medicare were given the option to go through private insurance companies to receive their Medicare benefits. These private plans are called Medicare Advantage(MA) Plans. MA plans are required to cover everything that Medicare covers, but it is up to the insurance companies to decide how they will cover it. Depending on the Medical Advantage Plan, visits to the doctor may be less expensive, but durable medical equipment might cost more. If you decide to use a Medicare Advantage Plan it is important to do some shopping around and find one that will meet your needs. There are many types of durable medical equipment. Most pieces of home medical equipment that can be reused are covered, including canes, glasses, and prostheses. These types of devices will be covered for people who receive Part B benefits. If you use a Medicare Advantage Plan, then these devices will also be available, but the cost may differ as specified by the private insurance company. In order for a piece of durable medical equipment to be covered by Medicare, it must be prescribed by a doctor or certified practitioner for use in your home. Long term care facilities can qualify as your home, but if you are using Part A Benefits to cover a hospital or nursing home stay, then it will likely not be covered. Some types of home medical equipment require that your doctor fill out a Certificate of Medical Necessity in addition to a regular prescription. A Certificate of Medical Necessity is just a more detailed prescription that must be filled out by your doctor. Mobility Scooters and electric power wheelchairs are covered by Medicare. In order to receive coverage, the insured must need the mobility device for use around the home. A mobility scooter or power chair that is only needed outside of the home will not be covered. It is also necessary to get a Certificate of Medical Necessity for these devices. Lift chairs feature a rising base that makes standing and sitting much easier and are partially covered by Medicare. Medicare will only cover the lifting mechanism of the chair. This is usually around $300 and the individual is responsible for the remainder of the cost. Lift chairs require a Certificate of Medical Necessity. Many of the devices that are covered by Medicare are also eligible for routine maintenance and repair that is partially covered by Medicare.Below is a list of some of the things that are classified as Durable Medical Equipment by Medicare. Items in red require a Certificate of Medical Necessity. For people who receive Part B benefits, the cost to the insured is usually 20% of the cost of the piece of durable medical equipment. Medicare will then pay the remaining 80%. However, the amount reimbursed can vary depending on the type of equipment. An annual deductible, currently $135 (2008), must also be paid in order to receive coverage. If you use a Medicare Advantage Plan, then the price may vary depending on which plan you choose. You are right about shopping around for a Medicare Advantage Plan. Before you sign up for one you should make sure you understand how their benefits work and the costs, because they really do vary company-by-company. Do you know how much you have to pay if your equipment breaks? @Carl: Thanks for visiting. The insured is usually required to pay 20% of the cost of the repair and Medicare will pay the rest. They also usually cover the maintenance of devices that are being leased to the patient. I am planning a post on this and will email you when I have it up.